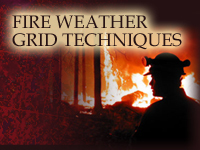 Fire Weather Grid Techniques: Relative Humidity and Dewpoint describes techniques and best practices for creating scientifically consistent grids of fire weather parameters. A case study is used to apply Smart Tools to model guidance to edit relative humidity and dew point temperature grids, and to demonstrate the advantages of editing dew point temperature rather than relative humidity to best represent the moisture in the atmosphere. 1. State how calculating 24-hour “change grids” can help forecasters generate more realistic forecast grids. 2. Explain the need to carefully check trends and values when forecasting changes to parameters used for calculating other grids. 3. Explain how examining recent observational data – either via observational grids or point observations – is essential to making realistic forecast grids. July 2014: This lesson contains products generated from the Eta model, which is no longer in operational use. The content and techniques remain valid related to editing grids.